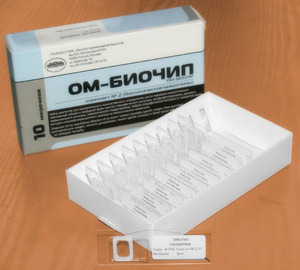 Biochip-based diagnostic kit "OM-BIOCHIP" for simultaneous quantitative determination of six markers of oncological diseases: total and free forms of prostate-specific antigen (PSA), α-fetoprotein (AFP), carcinoembryonic antigen (CEA), human chorionic gonadotropin (HCG), and neuron-specific enolase (NSE) — in blood serum by immunofluorescent method. The standard immunological methods of quantitative assay of tumor markers allow determination of only one marker in a clinical sample. To determine concentration of several markers, it is necessary to use several diagnostic kits that makes the assay a laborious and expensive procedure. The main advantage of "OM-BIOCHIP" test-system is the possibility to simultaneously obtain 7 parameters in one assay of blood serum sample: concentration of tumor markers AFP, CEA, HCG, PSAtotal, PSAfree, and PSAfree/ PSAtotal ratio (%). Biochip contains gel elements with immobilized monoclonal antibodies and gel elements with immobilized antigens (4 identical elements in a row). A mixture of fluorescently labeled monoclonal antibodies against PSA, AFP, HCG, CEA, and NSE is used as developing antibodies. The intensity of fluorescence signals from biochip gel elements containing corresponding immobilized antibodies is proportional to concentration of tumor marker in a sample. A mixture of fluorescently-labeled developing antibodies (10 µl) is added to a blood serum sample (50 µl). The samples, calibrators, and control sera are applied to biochips and biochips are incubated at room temperature or at 37oC. During incubation, tumor markers from the blood serum interact with biochip-immobilized antibodies and fluorescently-labeled developing antibodies (sandwich immunoassay). After incubation and washing, fluorescence images of the biochips are obtained using a Fluorescent Biochip Analyzer. 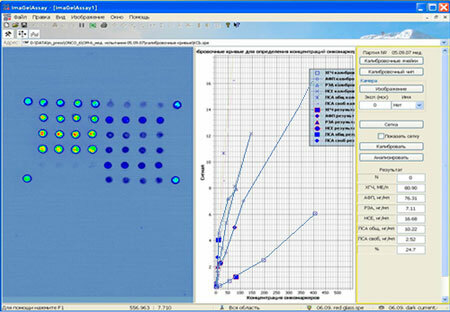 Using the fluorescence images of biochips after the incubation with calibrators and samples, the "ImaGelAssay" computer software (developed in EIMB RAS) constructs calibration plots for all six tumor markers and calculates concentration of AFP, CEA, HCG, PSAtotal, PSAfree, and PSAfree/ PSAtotal ratio (%) in the assayed serum samples and control sera. Calculation of results of biochip immunoassay of six tumor markers. Monoclonal antibodies with high specificity for each of the assayed tumor markers and without cross-reaction with other components of human blood serum provide high specificity of biochip-based assay. not detected till concentration of PSAtotal - 1500 ng/ml, PSAfree - 1000 ng/ml, AFP - 4000 ng/ml, CEA - 2000 ng/ml, HCG - 7000 IU/l, and NSE - 3000 ng/ml. At high concentrations of antigens in a sample, values of fluorescence signals from chip-immobilized antigens, which form binary complexes with developing antibodies, permit detecting the existence of false-negative (or underestimated) result (hook-effect). In this case the ImaGelAssay program displays the message about the necessity to dilute the sample and repeat the measurement; the message also specifies concentration of which of the six antigens is high in the sample. Variation coefficient (CV) for the repetitive measurements of PSAtotal, PSAfree, AFP, CEA, HCG, and NSE in the same blood serum sample using biochips from one batch does not exceed 10%. The results of the measurements of concentration of six tumor markers in blood sera using biochips were compared with the results obtained by reference methods. Concentrations of tumor markers in human sera were determined by ELISA method using "CanAg" diagnostic kits (Sweden) for PSAtotal, PSAfree, AFP, CEA, and NSE and "Immunotekh" kit (Russia) for HCG. A statistically significant correlation was observed between the results obtained with biochips and with the commercial test-systems. Photo of the box with biochips for test-system "OM-Biochip". The oncological diseases morbidity in the Russian population increases steadily during the last decades. According to the Federal statistics service data, 1226 thousand cases of neoplasms has been first diagnosed in 2000 year in Russia (8.4 cases per 1000 people), and 1357 thousand cases (9.6 cases per 1000 people) in 2005 year. According to the opinion of oncologists, decrease in malignant tumor morbidity and mortality can be achieved by wide propagation of preventive activities and early diagnostics. For 50% of oncological patients, cancer revealed by usual diagnostic methods is in a generalized form. Diagnostics of malignant tumors at early stages allows carrying out successful treatment for 90% of patients. Genetic violations in tumor cells result in changes in protein synthesis, particularly, in the synthesis of mutant protein forms, violation of protein expression - decrease or increase in the expression of one or another protein, appearance of proteins that are typical of embryonic period of development. 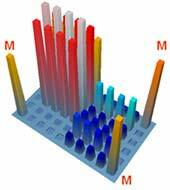 Qualitative and quantitative assays of all these proteins are usually carried out with immunochemical methods. Tumor markers are antigens that may be revealed in tumor tissue, antigens that circulate in a blood flow of people with oncological deseases. Lower sensitivity and specificity of immunochemical markers as compared with molecular-genetic ones is equalized with higher validity of immunochemical markers for monitoring oncological diseases and estimating the efficiency of cancer therapy since their concentration in blood more strongly depends on the tumor size. The assay of immunochemical tumor markers allows diagnosing tumors at early stages. Tumor marker Tumor for which concentration of the marker is elevated.